One Eternal Day: "When I Was Sinkin' Down..."
David Neff at Christianity Today reviewing a history of the original Fisk Jubilee Singers, "Tell Them We Are Singing for Jesus": The Original Fisk Jubilee Singers and Christian Reconstruction, 1871-1878, explains how spirituals ended up in all the hymnbooks. .... 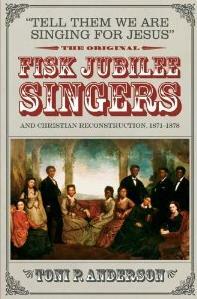 The story of the Fisk Jubilee Singers is ironic. White Christians aimed to give black Americans Christian civilization, but they received a dose of slave spirituality that shaped Anglo-American Christianity for the better. The Jubilee Singers embarked on their tours to demonstrate that former slaves could perform the best of the Western musical canon. They soon discovered, however, that the spirituals in their concerts moved their audiences deeply, and they devoted their revised repertoire to slave songs of faith. Their arrangement of "Steal Away," with its dramatic dynamic contrasts, left American and British audiences weeping.